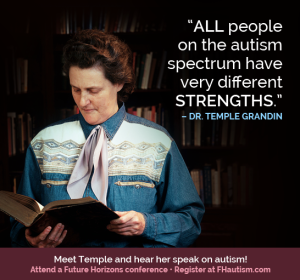 Temple Grandin and Jed Baker are speaking at this one day conference brought to you by Future Horizons. Dr. Grandin describes the challenges she has faced and offers ideas on how others dealing with autism can meet these obstacles and improve the quality of their lives. Backed by her personal experience and evidence-based research, Temple shares her valuable insights on a wide variety of topics, and offers useful do’s and don’ts. Dr. Baker is a behavioral consultant for several New Jersey school districts where, nearly two decades ago, he organized a group to help children with social communication problems. This conference is intended for family members and professionals. ASHA, APA, AOTA, and NAPNAP Credits are offered and APA Continuing Education Credit = 6. For more information, visit the Future Horizons’ Website here. This entry was posted in autism, autistic spectrum disorder, Conferences and Events, Research and tagged #autismconference, autism, Autism Awareness, Autism Conference, autism education, autistic spectrum disorder, developmental disabilities, Future Horizons, Jed Baker, learning, Resources, special needs, teaching, teaching tools, Temple Grandin by Different Roads to Learning. Bookmark the permalink.